I haven’t had a lot of time lately so I couldn’t really write any new entries, sorry. I’ve been making CDs and doing music performances for the first time in a while, so it’s been crazy busy. And of course being busy inherently means not having much downtime either. but it would also be nice to have some time to watch cartoons/anime once in a while. That said, let’s talk a little this time about cultural differences in the world of animation. We’ll split it up between Japanese “anime”, American “cartoons”, and the localization of both into other countries! Probably the first thing that should be said is that there are definite differences between animation in Japan and America. The biggest variations probably stem from a general difference in target audiences. A big chunk of Japan’s anime is aimed at around the high school age range. There’s also anime aimed a younger children, but it’s of fairly lower volume. And anime aimed solely at adults or older people are even less common. Obviously people outside the target age range also watch anime, but yeah. Based on the target audience, the genre and content is of course going to vary as well. Some of the most typically Japanese anime genres are things like magical girl shows and giant mecha anime. On the other hand, pure comedies with no drama, and shows with generally light stories aren’t too numerous. a sizable portion of anime have a single story being told continuously through every episode. It’s usually pretty difficult to be able to start watching in the middle and understand what’s going on. これでも1/10ほどです。 / This gives you about 10% of the episodes released, so far. One of the common names for American animation is “cartoons”. After looking it up, it seems that the origin of the word “cartoon” is from the Latin word “carte”, meaning “paper”. In America, traditionally “cartoons” have been mostly thought of as a thing for kids. Until about 20 years or so ago, that was pretty much the case, but recently cartoon sitcoms and adult cartoons have become more common. アメリカンカートゥーンといえば / The epitome of American cartoons. 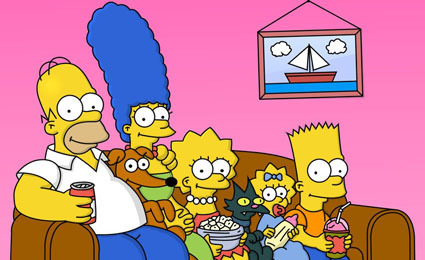 Probably one of the most famous cartoons from the States is The Simpsons. As it’s a sitcom, it’s something that kids and adults can both easily enjoy on their own. There aren’t really many examples of sitcom-like shows in the world of Japanese anime. Also, as mentioned, (non-pornographic) adult cartoons have also been on the rise recently. Most of them are comedies, but there are also some with darker/more dramatic themes. However, as opposed to many Japanese anime, there aren’t too many American cartoons with long continuing stories. For most cartoons, you can jump in at any episode and not be worried about not understanding something. アメリカの大人向けカートゥーン。下品な内容です。 / An adult-aimed American cartoon, lots of vulgarity. Of course, in America and Japan, many people watch animation from other countries. In America, Japanese anime has been extremely popular lately. The biggest source of this recent boom is probably TOONAMI from the late 90s. TOONAMI was a block on Cartoon Network which showed, among other things, a lot of Japanese anime. This led to a lot of kids getting into anime, fueling the popularity that’s still going on. 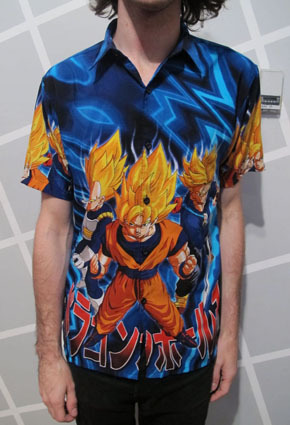 こういうTシャツが90年代のアメリカで大流行したんです。 / These shirts were really popular in the States in the ‘90s. That said, there aren’t a whole lot of American cartoons with popularity in Japan, are there? Everyone is probably familiar with The Simpsons, but aside from maybe superhero cartoons that seems to be about it. 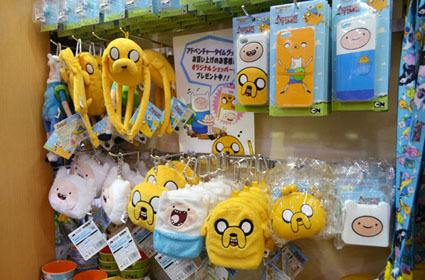 I was pretty surprised recently when I saw that Adventure Time was starting to be broadcast in Japan. It may be that the style of humor in recent American cartoons is hard to adapt for a Japanese audience. For example, in Adventure Time, one of the main character’s catch phrases is for whatever reason “Mathematical!”. It’s already kind of meaningless, and translating it into Japanese it seems like it would lose it’s charm altogether. It does seem like the show is doing well here, though, which is encouraging. こんなものが日本では売っています！ / You can buy stuff like this in Japan too! Anime song remixes are relatively common, but there aren’t too many remixes of American cartoon themes. They do exist, though! This is “Powerpuff Gabberz” from DJ Sharpnel, a remix of the Powerpuff Girls theme. A Japanese person remixing an American cartoon is pretty cool! but if you have any recommendations do let me know!